Southern flying squirrel is one of the only two types of Flying squirrels found in North America. It is slightly smaller in size than the other one that is found in this region. This species of mammal is amazing to observe and know about. They are as cute as any squirrel and as efficient as any other flying creature. Find out all about this marvelous creature in the article below. Size : They are about 7.75 inches to 10 inches long measuring from their heads to tails. Color : Their fur is grey or brown on the upper part of their body. Their underneath parts are grey colored. Face : They have small and round shaped heads. Their eyes are round, big and black colored. They have tiny and pointed ears on two sides of their heads. Body : This mammal have a furry membrane on either side of it body, joined from their fore limbs to their hind limbs. It glides with the help of this membrane that looks like wings. It has a cute, furry and fattened tail. These squirrels are very interesting to observe. Their behavioral traits combine both of squirrels’ and bats’. They watch their prey from high above the tree-branches and then sweep down to grab them. Their first mating season occurs after 1 year of birth. Though they glide still they are considered as mammals and not birds. Their gliding ability is their most useful adaptive feature. 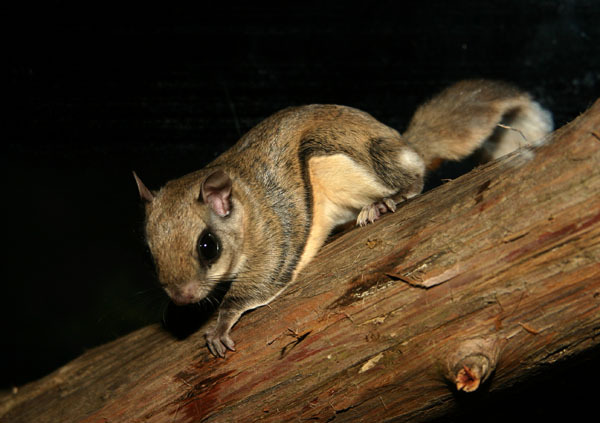 Southern flying squirrels mainly diet on acorns, berries, seeds and nuts, eggs of birds, lichens, small dead animals and insects. These mammals chew on antlers and bones of other dead animals to sharpen their teeth. This also acts as a good source of calcium for the species. 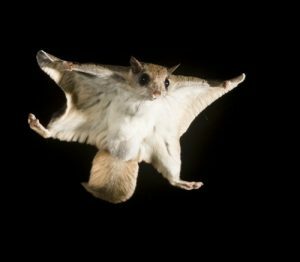 This sibling species of the only two of Flying squirrels is found in eastern parts of North America, stretching from Canada to Florida. Their existence has also been recorded in some parts of Honduras, Guatemala and Mexico. These squirrels dwell in deciduous forests. They reside on high up the trees in abandoned nests of grey squirrels and woodpeckers’ holes. The territorial range of these mammals varies between 0.5 acres and 4 acres. Hawks, eagles, weasels, owls, cats, coyotes, foxes and many more such animals both in wild and sometimes in domesticity as well. These humble, little mammals do not have much of adaptive features apart from their gliding ability. When they are threatened by bigger birds flying atop trees, these squirrels glide downwards through the branches of trees and get into denser zone where the bigger birds cannot enter. 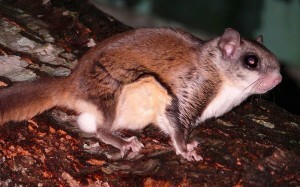 When these flying squirrels face threat on ground by other carnivorous mammals, they climb up to higher branches of the trees. 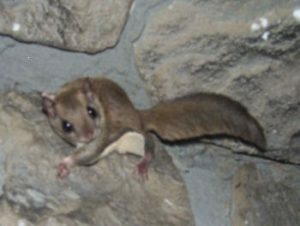 Mating season of Flying squirrels depend on the latitude of their distribution range. In the northern zone of their range, mating occurs between spring and fall. In the southern zone of their inhabitation, mating occurs between late summer and winter. Both sexes of this mammal species attain sexual maturity at the age of 1 year. The gestation period lasts for about 40 days. New born Southern flying squirrels are hairless, blind and even their ears are folded close. They weigh only 4 gm when born. Their ears unfold and open up on the fifth day. The eyes open up about 24 days later. In 12 weeks the juveniles metamorphose into adult Southern flying squirrel look alike. These squirrels have a life span of 6 years to 7 years in the wild. They have been observed to have lived for about 12 years to thirteen years in captivity. These mammals don not have any sub-species. However, they have one sibling species known as the Northern flying squirrel. Housing : (i) The cage housing one Southern flying squirrel should be 16 inches deep, 16 inches in width and 30 inches in height. (ii) It is advisable to provide the mammal with as much natural resources as possible. Provide some tree branches inside for them to climb and play around. (iii) Provide a cozy hanging pouch inside for them to sleep. This is a perfect natural set up for the sweet pet’s slumber. (iv) Some cotton should be provided for them to nest inside the cage. (v) Spread enough newspaper at the bottom of the floor of the cage. This makes cleaning excretory matters of the pet from the cage easier. Food & Water : (i) Give them their regular diet as in the wild. Nuts, fresh fruits, vegetables, etc. (ii) Keep a water bowl of 8 oz. measurement inside the cage. Caring : Carry the cute and favorite pet along in pocket or a pouch most of the times for initial couple of weeks after getting it home. According to IUCN reports this species is completely safe and faces no threat to their existence. The association has listed the Southern flying squirrel under Least Concerned category. Find out the most interesting facts about this amazing species of mammals listed down below. Though their name suggest that they might fly, but in real they glide. Despite having wings and gliding ability this species is a mammal. These squirrels attain sexual maturity in just 1 year of age. They are very friendly creatures. Their existence is completely safe despite the environment being affected and wildlife affected in turn. I have a 6 month old male flying squirrel that I have raised since the age of 5 weeks. I am interested in purchasing a female flying squirrel around the same age as a companion for him. Is there any place that you know of that sells these wonderfule little creatures. I am thoroughly enjoying my flyer, but feel that he would enjoy a companion. As a licensed Virginia Rehabber I can tell you that it is not legal to sell or to keep a flying squirrel in captivity. Rehabber take them in and release them back to the wild as soon as they are able to survive on their own. To contact a rehabber in you area look on the Department or Game and Inland Fisheries. A list can be found on their website.